There are two basic stabilization processes in current practice, namely aerobic digestion and anaerobic diges tion. Characteristics of these two processes are listed in Table 14. From Table 14, it can be seen that the aerobic digestion process is a continuation of the process carried out in the secondary wastewater treatment unit. The major difference between them is that the effluent (supernatant) from the settler must be recycled back to the head end of the plant due to high concentrations of suspended solids and organic compounds. 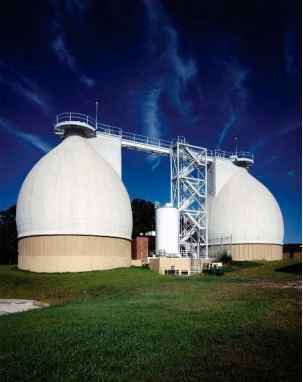 In contrast to aerobic digestion, the mechanisms of anaerobic digestion in sludge treatment processes are very different from that in the secondary wastewater treatment, which is aimed at organic phosphorus removal. The differences can easily be identified through a com parison between Table 14 and Figure 6. As in the aerobic digestion process, the effluent (supernatant) must also be recycled back to the plant in order to meet water quality requirements. In recent years, egg shaped anaerobic sludge diges ters have been constructed and installed in a number of sludge treatment plants, which are superior to the conventional cylindrical tanks shown in Figure 3. Two egg shaped anaerobic digesters are shown in Figure 11 . Figure 10 Air flotation thickener.